Pair of highly decorative & heavily carved Chinese dragon armchairs. 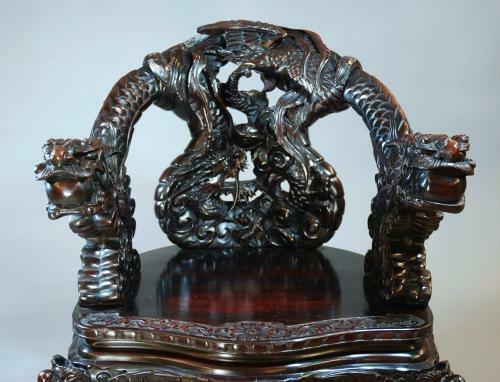 Both chairs consist of heavily carved dragons, the backs being the scaled dragon body leading to the arm rests which are formed by the dragon head holding a pearl in their mouths. The pearl in the mouth represents treasure & prosperity. There is a carved floral decoration on the edge of the seat & underneath are moulded seat rails with heavily carved & pierced frieze rails with scroll design on every side. The carved cabriole legs consist of winged bat creatures, the bat being a symbol of good fortune. These are finished with a dark stain so it is hard to determine the wood type. This pair of chairs are in very good condition & of stable construction. The chairs have been repolished as they were dull & the front legs have been titened up, so the chairs are now in excellent condition.